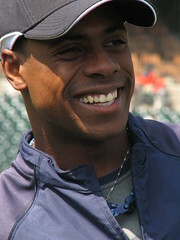 • The Yankees would receive Curtis Granderson from the Tigers and one or two prospects from the Diamondbacks. • The Diamondbacks would get Edwin Jackson from the Tigers and right hander Ian Kennedy from the Yankees. Kennedy is a young pitching prospect in the Yankees organization who has a lot of potential. He has a four seam (88-94 mph) and two seam (a newer pitch at around 89 mph) fastball, great command of a plus-changeup, as well as a curve and slider. Kennedy is a very intelligent pitcher choosing to set-up hitters and attack their weaknesses rather than try to overpower them. He has great mechanics and uses this and control to his advantage. Kennedy just hasn’t seen his skills translate to success at the big league level yet due to nagging injuries and the fact that the Yankees continue to have a crowded rotation. • The Tigers would get right hander Max Scherzer from the Diamondbacks, and center fielder Austin Jackson and left handed relievers Phil Coke and Michael Dunn from the Yankees. Jackson is another shining star that the Yankees have waiting in the wings. Jackson is a good contact hitter with some good power potential. Needs a little more polishing at the plate to really establish himself (already started this by cutting down his strikeouts). He is a strong athlete who will be a very nice base stealer someday with his plus speed. Also transfers his speed well in the outfield and is also plus defensively. This would certainly be an interesting move as none of the teams really get “ripped off” at all. Of course as I always say, I hate seeing the Yankees getting stronger. This is one of the most exciting times of the year if you are a baseball fan. All the trade speculation. All the free agents floating around looking for a new home. It’s an exciting time. Between now and the start of spring training, it’s my goal here at The Diamond Cutter to try to keep you updated on all the ins and outs of this off season. I’ll be using a variety of sources from ESPN Insider, MLBTradeRumors.com, local news sites and more. · ESPN Insider has been repeatedly linking the New York Mets to Roy Halladay which I find to be quite a stretch. I just don’t think the Mets have the prospects available to make a move despite what some “experts” say. Names like Edwin Mejia, Ruben Tejada and prized prospect Fernando Martinez have been mentioned to be possibilities. The blurb also mentions the possibility of the Mets taking on Vernon Wells’ astronomical contract as part of the deal which would definitely sweeten the deal for the Jays. · According to MLBTradeRumors.com the Chicago White Sox are once again linked to being interested in bringing in free agent Coco Crisp to play center for them in 2010. Crisp had a tough stretch for the Royals hitting only .228/.336/.378 in 215 plate appearances last season during a shortened season due to injury. Crisp definitely still has a lot left in the tank and will make some team very happy next season. · Both FoxSports.com and ESPN.com have talked quite a bit about the Detroit Tigers moving lead off hitter Curtis Granderson to help cut payroll. FoxSports.com has linked the Los Angeles Angels to the lefty and others have tied him to the Mariners and Cubs. Both intriguing options, but I personally would like to see him land in Seattle alongside Griffey and Ichiro. And speaking of the Tigers, DetNews.com has indicated that Miguel Cabrera has even been added to the list of available Tiger players. That would be the waiving of the white flag in my book. · ESPN Insider has discussed what options the Seattle Mariners have next season to help bolster their weakened infield. While the club is trying to bring back Russell Branyan to play first base next season, they are going to need to do something with the impending loss of third baseman Adrian Beltre to free agency. Names like Nick Johnson, Jim Thome, Casey Kotchman, Carlos Delgado, Orlando Hudson and Dan Uggla have been tossed in as possible candidates. I plan on digging a bit deeper into the 2010 Seattle Mariners later this week as I bring back the popular “GM for a Day” series where I go into detail of what I would do to turn their ship around. For a look back at a few of the teams I did this for last year, look to the right hand column of this page under “Best Of” and give it a look. I’m pretty impressed with how many of my ideas took off for these clubs. · Now it’s time for the lightening round for rumors. Hang on tight as they are coming fast and furious: Slugger Adrian Gonzalez looks to be staying put in San Diego for now…the Twins could have a great present for their fans with a signed MVP catcher by Christmas…the Mets may have interest in bringing in Jack Cust…Jermaine Dye is willing to move to first base if it gets him a job…the Rockies don’t want Mike Lowell to fill their third base hole…the Braves are already looking to move Derek Lowe out of town…and the Phillies have Placido Polanco, Mark DeRosa and Adrian Beltre on their radars to sure up their infield. You are currently browsing the archives for the Curtis Granderson category.